Living in Brazil has many interesting aspects. The different approach to food is one of these. People are connected with local farms through their friends and family, and enjoy organic homegrown food. When it comes to eggs, the sizes and the color of the shells vary, but eggs from family farms have darker yolks. 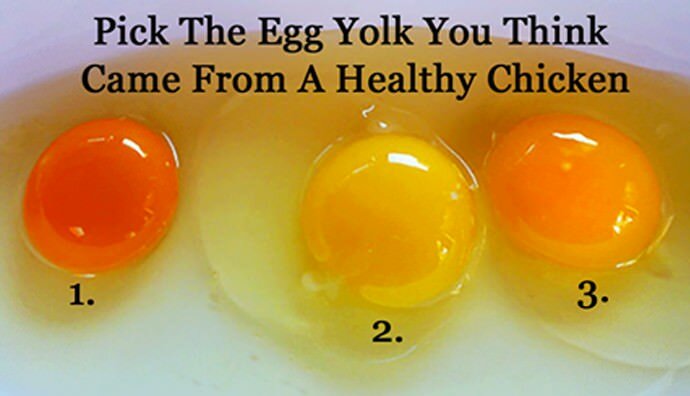 The yolks are always thicker than typical egg yolks you can buy from stores. In the US eggs found at the local supermarket are yellow. Organic, vegetarian or cheap – they are all yellow, and their yolk is not that thick. Wondering what makes them so different? Is it possible that we all eat eggs from unhealthy chickens? Have you ever bought an orange egg? Recently, we have “discovered” an egg from healthy chicken. That is totally insane. Craigslist is the usual go-to route, when it comes to accommodating urban life with homestead flare and seeking for the dankest foods. From Garden Betty… Let’s compare pasture-foraging, insect-pecking, soil-scratching, whole grain-feeding chickens’ yolks to the yolks from free-ranging and factory-farmed chicken. The differences are clearly visible. Homegrown eggs are darker orange, fuller and thicker. The eggshells are also denser and much harder to crack. And how about the orange yolks? Orange yolks indicate a well-balanced diet high in nutrients. Xanthophylls, omega-3 fatty acids, and meat are the key factors into the making of orange yolks. Xanthophylls are carotenoids, and carotenoids are natural plant pigments contained in fruits and vegetables. Beta-carotene, one of the most popular carotenoids, gives yolks their orange pigment and most people associate it with carrots. But, beta-carotene increases yolk’s nutritional value, it is not just the color. Xanthophyllis the carotenoid that causes deeper yolk coloring, and it is more readily absorbed in yolks. Lutein is a type of xanthophyll, and a lot of lutein results in deeper orange color. Xanthophyllis contained in leafy greens, such as spinach, kale and collards. Itis also found in zucchini, broccoli, and Brussels sprouts. Flax seeds and sea kelp are rich in omega-3 fatty acids, and these both are essential components of homemade whole grain chicken feed. Did you know that chickens should not be vegetarian, regardless of what your premium carton of organic, grain-fed, cage-free eggs says? Chickens are actually omnivores, and the healthiest diet includes meats, including mealworms, beetles, grasshoppers, grubs, and other crawly “goodies” that pull out of the ground. Some chickens even attack small rodents and snakes (ballsy chickens out in the boonies). When all these sources are well incorporated in hen’s diet, the nutrients they are being fed with later pass on their eggs and concentrate in the yolks. According to the egg analysis by Mother Earth News, and another recent analysis of Pennsylvania State University, pastured eggs have a lot higher levels of vitamins A, D, and E, beta-carotene, and omega-3 fatty acids. Pastured eggs are better for you, and that is the reason why many people like raising chickens. How can you get the delightful orange yolks from backyard chickens? Let the chickens in your garden, especially if you decide to dig over new beds, or a new patch of dirt in the chicken tractor, and let them seek for an orange-boosting bug delicacies. Chickens should eat fresh greens to increase the lutein content in the yolks. Make sure they get enough dark greens. The darker, the better. Combine edible amaranth (our favorite summer greens), kale, collards, broccoli leaves, or whatever grows in your garden. If it is winter, give them some alfalfa. Do not feed your chicken with corn; that is a cheap trick factories do. Corn gives yolks nice golden color, but they have lower nutritional value. After a few weeks you will be fine with all those orange yolks, and eventually you will not even think that they have changed the color. Buy eggs from the supermarket and compare the yolks. You will be amazed by the difference! These are great observation by Garden Betty. Check some more explanation by food and nutrition. The color of the yolks depends on hen’s diet, not the breed or the freshness of the egg. Artificial colors are not permitted in eggs. Feed rich in greens, yellow corn, alfalfa, and plants with xanthophyll pigment (yellow-orange) will give you nice and dark yellow-orange yolks. If chickens eat wheat or barley, you will get pale yellow yolks. Chickens fed with white cornmeal give colorless yolks. Free-range chickens have better access to pigmented food and they give eggs with dark yolks. According to the American Egg Board, consumers in the US like their yolks light gold- or lemon-colored. Always buy eggs from trusted farmer and make sure you know more about the diet of his chickens.